Go dust off your Arc Barrel and Spine Corrector and have some fun with sequences and progressions not covered in the Power Pilates Comprehensive Certification. This workshop will give you a better understanding of how and why to use the barrels in both your own and clients sessions. Aubrey received her BA in dance from Point Park University. She is a PMA certified instructor and received her comprehensive training through Power Pilates in NYC. 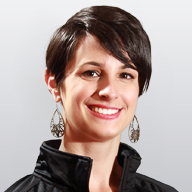 Aubrey is also a teacher trainer for Power Pilates and annually holds mat and comprehensive trainings at the studio. She regularly attends continuing education workshops and seminars to further her knowledge and education. In 2013, Aubrey auditioned and was accepted as one of only twelve people from around the world for a program at Vintage Pilates in LA entitled "The Work." Through this program she had the privilege of studying with world renowned teacher and Pilates elder, Jay Grimes (who studied directly with Joe and Clara Pilates.) Upon completion of "The Work", Aubrey was selected to continue her mentorship with Jay at Vintage Pilates for the next iteration of the program, entitled "Teaching the Work". Concurrently Aubrey is also mentoring under another world renowned teacher, Kathi Ross-Nash, through her program "The Red Thread". Kathi has studied closely with first generation teachers such as Romana Kryzanowska, Kathy Grant, Sari Mejia Santo, Jay Grimes and Edwina Fontaine. Find Aubrey Johnson at a studio near you.